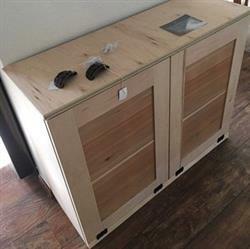 This bin is raw or unfinished. It's ready for you to paint or stain once you get it home. Of course, if you just left it in it's beautiful, unfinished state, that would be okay, too!! It's beautiful!!! We have stain we purchased that came with our custom cabinets and the hardware from Hobby Lobby matches our kitchen hardware as well! I'll post another picture when we get it done. Thanks again for the excellent communication, instructions and quality workmanship! So ready to get rid of the mess around the fireplace! I am excited to receive my trash cans, and can't wait to paint them! They are very sturdily made, and were very well packaged/wrapped for shipping. Would definitely order from this shop again. It's worth the wait.